Most people who have played WoW should be familiar with the core concept of the Armory -- it's a tool that you can use to look up other players, see their build, progression, and so on. For non-light.gg members, sadly, that's where the fun ends. Bungie's API is pretty strict when it comes to what it will let you see anonymously, so that's unfortunately all we can churn out for anyone that hasn't signed in. However, for light.gg members, your profile goes into more detail. The leaderboard section will expand to let you see your rank on every leaderboard at once. 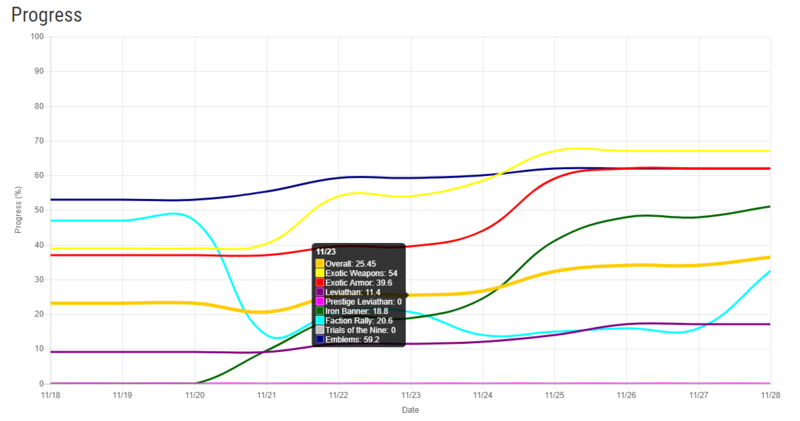 The progress section gives you an up-to-date chart of your progress on the site over time, so you can see that spike when you finally got your last exotic and maxed it, or see the gradual increase from grinding out masterworks. Hopefully this gives some fun insight to light.gg members to be able to check out their progress, as well as the progress of other people on the leaderboards. I'm hoping that being able to click on someone on the leaderboard and actually dig around on their profile makes competing more interesting and personal. Being able to see someone's collection from their profile and compare it to your own. Being able to save, share, discover, and equip builds of your own or from other players. Keep an eye out for these features and more in the next few weeks. Until then, I look forward to hearing your thoughts on the Armory and other new features in 1.1!